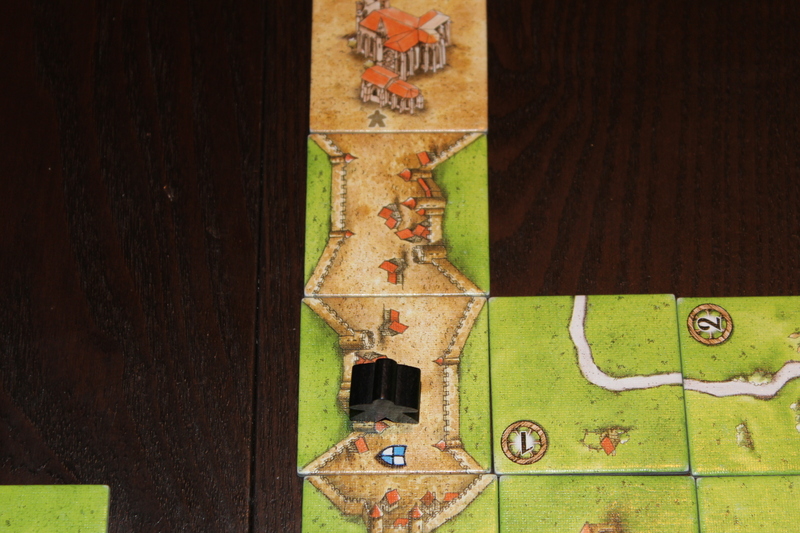 #17 – Carcassonne: Inns & Cathedrals [Expansion 1] – What's Eric Playing? September 27, 2015 April 30, 2016 • What's Eric Playing? Base price: $20? (Good luck finding the old edition, but it’s $20 for the New). So, I’ve never actually reviewed just an expansion before. Sometimes I’d review the expansion along with the base game, but I want to spend a bit of time talking about this one, especially since Z-Man has decided to completely redesign the base game (and these expansions). Now, I could go on and on with my opinions on the redesign (and, indeed, already have), but I’d rather focus on the game. 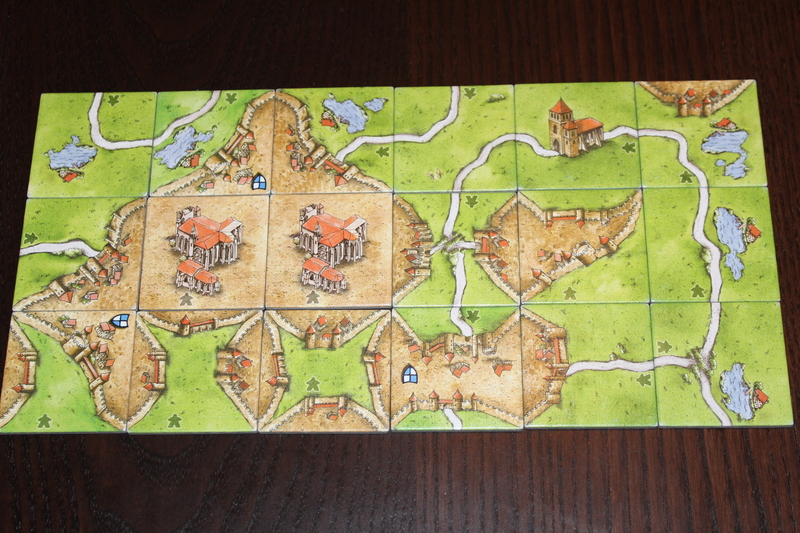 Carcassonne: Inns and Cathedrals is the first of … ten? Yes, ten large expansions for the base game, each drastically overhauling the rules in their own special way. I’ll highlight what’s different, and then we’ll launch into our usual Setup/Gameplay/Discussion. So, Inns and Cathedrals (I&C, henceforth) adds 18 new tiles to the game, each politely branded with a large meeple emblem so that you can un-add them if you so choose (why you would is an entirely different but still useful question, unless the answer is storage). Let’s talk about each of them in turn. Also, in order for this to make sense, you might want to read the Carcassonne Setup and Gameplay in my previous blog post if you’re not already familiar with the base game. If the road is completed, score two points per tile in that road. If the road is not completed, score zero points per tile in that road. 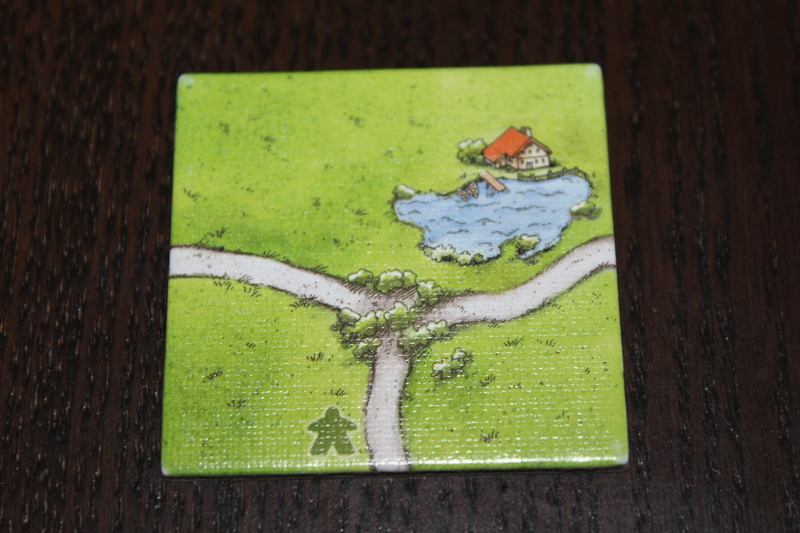 This particular tile only has an inn on the rightmost road segment. The other road segments do not receive the bonus or the negative effect. If the city is completed, score three points per tile and pennant in that city. If the city is not completed, score zero points per tile in that city. So while it’s not quite double or nothing (which would be obscene), it manages to make cities more valuable while forcing you to build even larger ones. 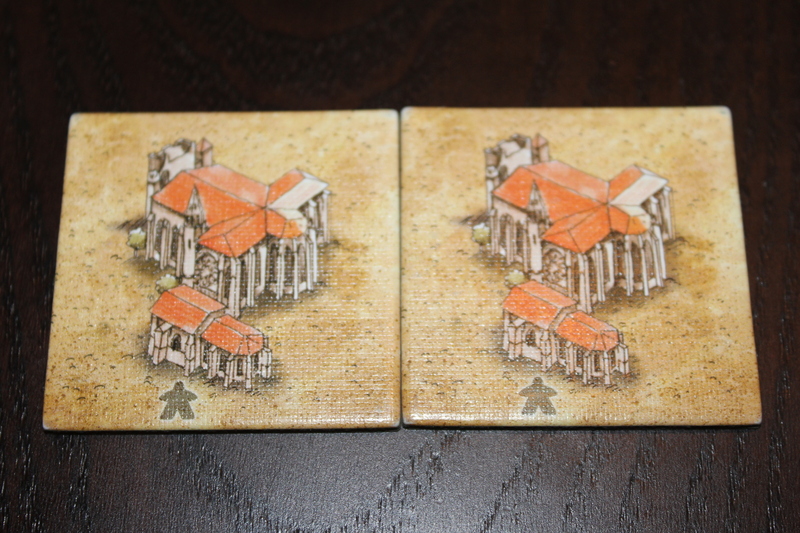 The smallest city you could build with a cathedral is still worth 15 points (one cathedral + four city end tiles). Note that it is possible that a cathedral tile cannot be played in the current board when it’s drawn (you may not have the correct space for it). If so, discard it from the game. Sad! Also, like inns, additional cathedrals in a city do not increase its value. Though having both cathedrals in one city is literally preposterous, anyways. One of these meeples is not quite like the others. In fact, it’s nontrivially larger (just barely, though — it’s still easy to confuse the two). The Big Meeple is a new meeple added for I&C, and it gives you a total of eight playable meeples during gameplay (since you lose one meeple by default for the scoreboard). Like a normal meeple, it can be played as a thief on roads, a knight on cities, a farmer on fields, or a monk on monasteries. However, it is worth two meeples when it comes to determining control of a feature. So if you’ve got your Big Meeple and your opponents have their small meeples in a field, that’s your field. The Big Meeple doesn’t know how to share, only how to take. but that’s only 8 of the 18 tiles and an extra meeple. What else is in there? Yes, that’s a double-turn and three- and four-way city-ending tiles. The two city-ending tiles with a road ending between them is particularly egregious, but the roads going into the cities are not scoreable. Because they’re basically not there. These tiles are a bit obnoxious, but they have their uses. Especially the top two. The only real things worth noting here are that the bottom-right tile is two separate city tiles, the bottom-left tile is a monastery that ends both of those road segments, and the top-middle tile is a city-ending tile that splits the tile into two separate fields. Still a bit weird, but much less so than the other 5. And that’s everything new! Let’s resume our previously scheduled discussion and review. 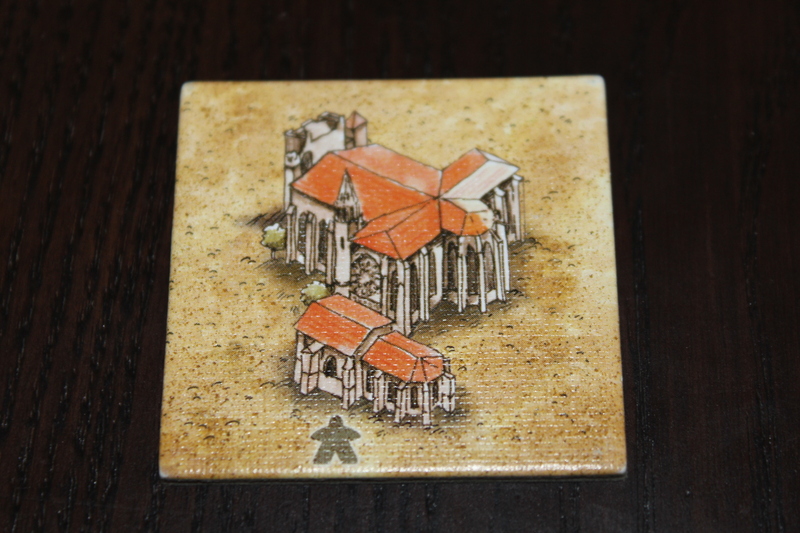 Throw these tiles into your tile bag with the base game tiles. Or shuffle them with the base game tiles. However you mix up the tiles is really your business. Take out your scoreboard, add one of each player’s meeples to it, and then you’re good to go. 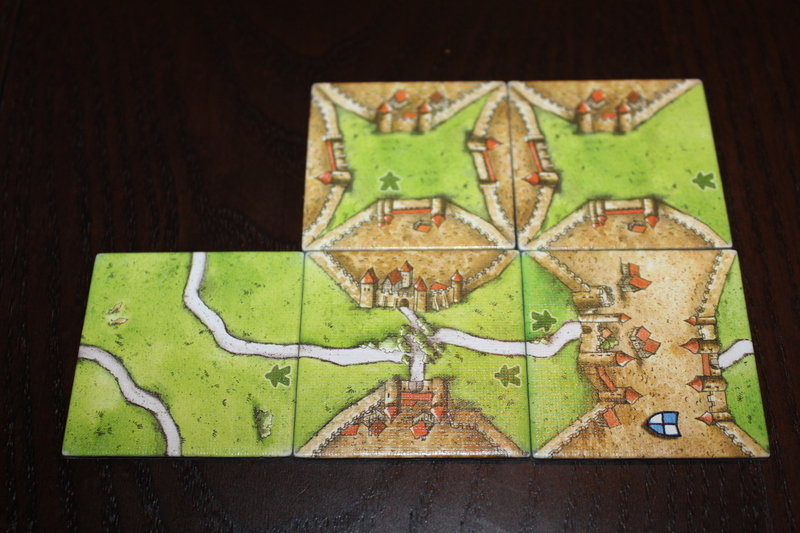 For more information, please see my previous explanation in my Carcassonne [Base Game] review. Inns and cathedrals both make incomplete features containing them worth 0 points. 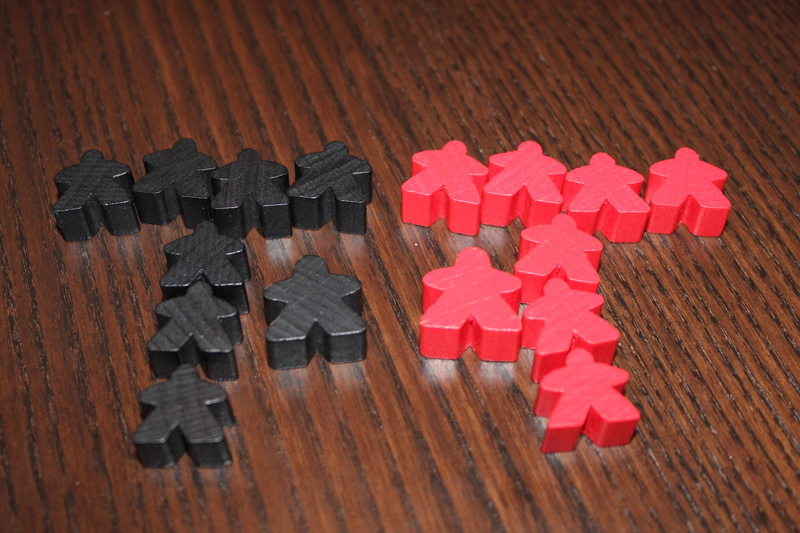 The Big Meeple counts as two meeples. However, the major change here is in strategy. While the same strategies from base Carcassonne mostly apply here, too, there are a number of new things to keep in mind specifically from I&C. You can use inns and cathedrals offensively, not just to help you. While I wouldn’t recommend this for inns because it’s trivially easy to finish a road, slapping a cathedral onto another player’s city late-game is a great way to turn a 10+-point city into a worthless waste of a meeple. It’s actually a pretty solid move. Now they need to get three tiles to complete that city (at minimum) rather than just one, if you played it on the last spot they needed. For instance, if black is working towards a long city near the end of the game, red might want to slap down a cathedral they just drew on their turn like so: This makes it almost impossible (or, at least, very unlikely) that black will be able to finish the city before game’s end, meaning all the tiles used in that city’s construction are effectively wasted. Bonus if you can manage to connect two+ cities and ruin all of them. Farmers are slightly less useful. 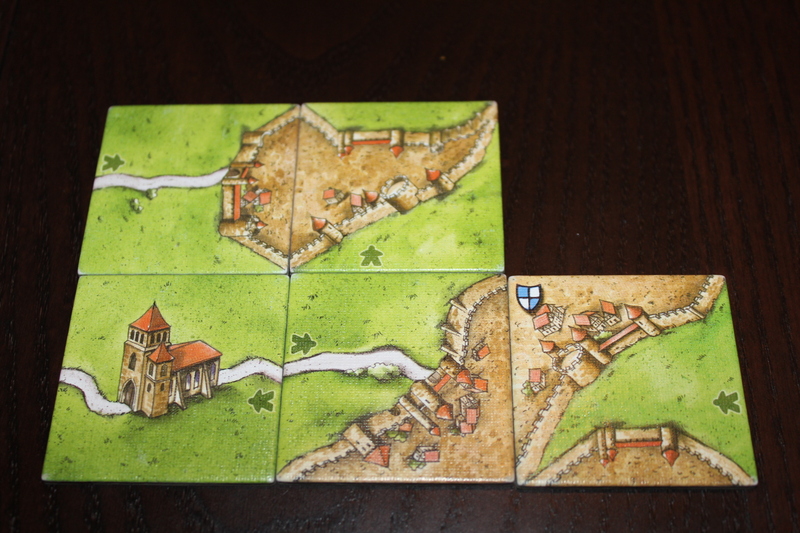 In base Carcassonne, you tended to see a lot of smaller cities just due to the nature of the tiles. Cathedrals tend to increase city size, so you will likely have fewer small cities and a couple large cities instead, making farmers a bit less worth the long-term meeple investment. This isn’t always the case, but it happens a fair amount. Use the Big Meeple. Someone once told me that having something for yourself is better than sharing. They then pushed me over and took some of my Pokemon cards. My childhood trauma is still a worthwhile lesson for Carcassonne, as that double meeple can quickly turn a city shared by a few people into a You-topia. (Get it? Because it’s yours and it’s a perfect city? I’m using You instead of U, the letter, which is also humorous because in this interconnected day and age it’s much more common for people to use U instead of You! It’s a joke that does more than one thing! It’s a pun and a commentary on the internet age! Alright, I think you get it.) Regardless, it’s handy to take cities and roads with early on, but also very useful to steal farms late-game. The threat of a Big Meeple is also pretty effective. Sometimes it pays to start a city or long road with your Big Meeple, as it also discourages people from trying to join on and share points with you. To do so, they either have to use their Big Meeple too, or, if they don’t have it, somehow miraculously connect two meeples to your existing feature, which is difficult. Doable, but difficult. Don’t use a Big Meeple on a cloister. Making a Big Meeple into a monk is a waste, as there’s no way for another meeple to try and horn in on your points. Just don’t do it. Make sure you don’t forget how the scoring works. Nothing worse than making a super long inn road or huge cathedral city … and then the game ends and you forgot to complete it. That’s just … embarrassing. And worthless. Manages to add some new gameplay mechanics without discarding the old ones. There are only six inns and two cathedrals; you will build more roads and cities than that. This just adds in a nice almost press-your-luck mechanic to see if you’re willing to take a risk for a huge reward. Risk/Reward mechanic is satisfying without feeling too random. It’s decently rare to get totally screwed by an inn (or a cathedral that you play on your city — keep an eye on how many tiles are left); if you don’t think you’re going to get it done, just give it up as a lost cause and move on. Tight expansion. There aren’t too many new tiles, and they synergize fairly well with both the old and other new tiles. This is how an expansion should be made. Late-game cathedraling someone’s city is inherently satisfying. Sending that city straight to zero points feels great and I strongly encourage it. 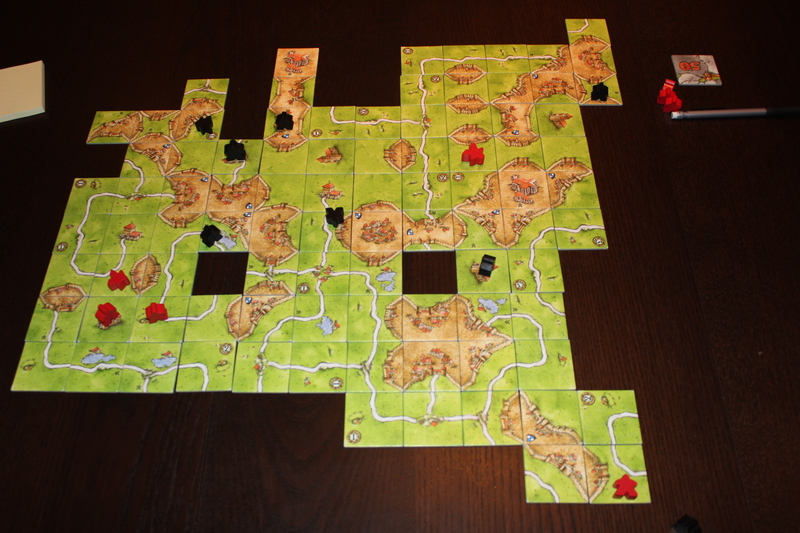 It also encourages thinking outside of the box with the game mechanics, as it’s not immediately obvious that that’s a good strategic decision, and if it’s early in your Carcassonne career you’re not thinking about blocking other players as much as you are thinking about maximizing your own score (this is somewhat dependent on the number of players you have). The Big Meeple makes competing for features more satisfying. Now you have choices about which meeple to play, and those choices are important. Is it worth potentially tying up your Big Meeple to steal something from your opponents, or should you settle on sharing the feature’s points and going after someone’s farm instead? Or do you spend your Big Meeple early to take some prime farmland, uncontested? There are a lot more decisions here, and I think that it adds a lot. Some of the new pieces are just, great. A lot of the inn pieces add a few good road features, and the new city pieces (not cathedrals; the others) also add in a pretty significant variety, even if they are weird. Using the three- or four-way city ending piece is great for blocking someone trying to join up with your city or getting three or four tiny cities to rapidly boost your farm score. Adds a lot of variety as well as strategy. The Big Meeple should be larger. It’s not immediately clear that the Big Meeple is not just a normal meeple, and this causes some consternation among players when they’ve just lost a feature because their opponent played the Big Meeple without them noticing. Is it their fault for not paying more attention? Probably. Is it still mildly irritating? Sure. Could have at least given it a hat or some fancy pants or something. Extra decisions slow down some players’ turns. As with literally almost all expansions, the extra content adds in additional decisions that the player must make. This sometimes causes turns to take longer, as a lot of times they’re deciding, “is it possible for me to complete this inn road / cathedral city?”. That’s okay, but it’s still a meh. The weird pieces are really weird. That double-turn piece is almost never wanted. I have not seen anyone be like “THANK GOD I NEEDED THIS”. I doubt I ever will. Frustratingly, I can’t think of any. 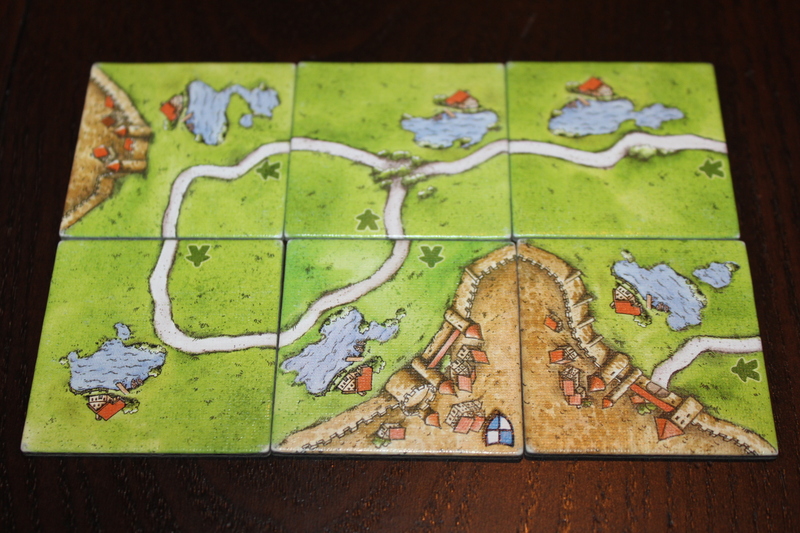 There’s really no good reason for a Carcassonne owner to not get this expansion. Seriously. Yeah, I know. It’s weird for me, too, but this is quite possibly a perfect expansion. I have no complaints. In fact, when I’m teaching this game, I usually include I&C because it effectively is part of the base game, as far as I’m concerned. For me, the extra tiles make the game just slightly longer (which, for once, I actually like) and they add additional variety and strategy for a very low overhead. This is one of the best expansions for any game I’ve owned (probably along with Pandemic: On The Brink), and it has the added benefit of improving on a game I already love. While I don’t think it necessarily boosts Carcassonne to a perfect 10, as an expansion, I think it deserves a perfect score because of how well it augments its base game without detracting anything. I also accidentally took another I&C tiles picture, so, here you go. 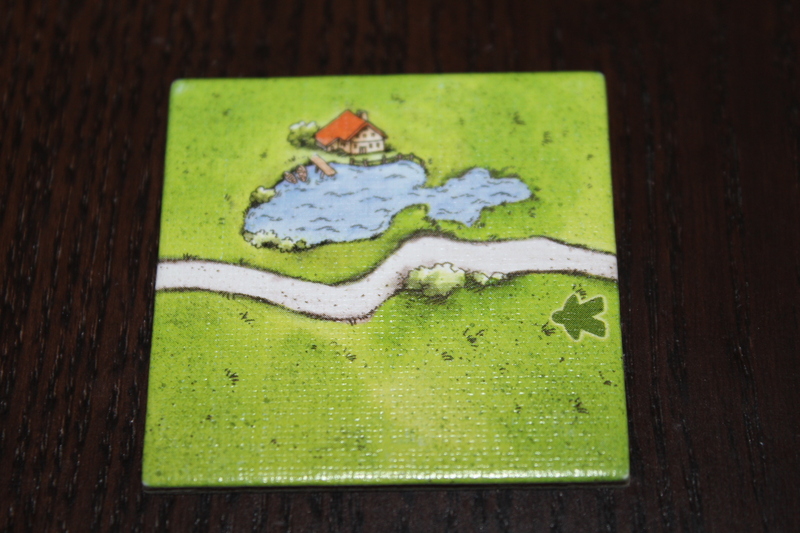 Posted in reviewTagged board game, board games, carcassonne, competitive, competitive game, expansion, tabletop, tile game, tile games, zman gamesBookmark the permalink.